BOSTON (JTA) — Four questions. Four cups of wine. Four types of children. At Passover, the number four figures prominently in the rituals of the seder, the ceremonial holiday meal that can be mesmerizing and mystifying. Four new delightful and brightly illustrated books for young kids will enliven — and help explain — the popular eight-day spring holiday, which this year begins on Friday evening, April 19. In this first of four planned “Sesame Street” board books from Kar-Ben, publisher and children’s author Joni Kibort Sussman teams with longtime “Sesame Street” and Muppet book illustrator Tom Leigh to offer little ones an entertaining introduction to the Passover rituals and traditions as Grover, Big Bird and their “Sesame Street” friends go to Avigail’s Passover seder. Cookie Monster can come along, too – but only if he eats special Passover cookies. Grover tells his friends it’s good to invite guests to the seder. Even Moishe Oofnik the grouch is included. In this lively, rhyming story, an adorable mouse named Pippa is preparing for the seder. She sets the table and stirs the chicken stew. But where’s the special shiny gold seder plate placed in the center of the table to display the ritual foods eaten at the ceremonial meal? Kids have fun as they follow Pippa in her search. 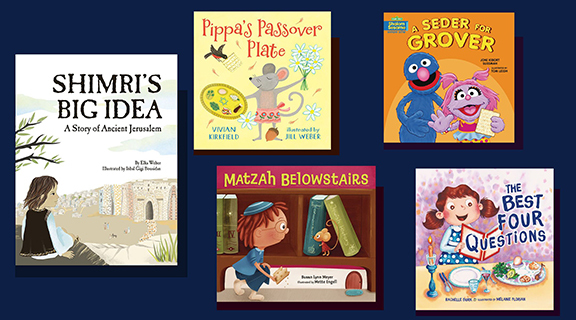 Author Vivian Kirkfield’s playful verse introduces kid to the seder rituals, while award-winning artist Jill Weber’s bright, large format illustrations are brightened with colors that match the springtime festival. Marcy is the youngest child in the family who has just learned to read, and it’s her turn to ask the Four Questions at her seder. A vivacious and inquisitive girl, Marcy turns down all offers of help to practice reciting the Four Questions. She doesn’t realize that she’s expected to read the traditional questions from the Haggadah. She’s come up with her own questions — such as, how many matzah balls in Grandma’s chicken soup? Rachelle Burke’s lively and engaging storytelling underscores the tenet of Passover that encourages participants to ask questions. Melanie Florian’s brightly colored animated illustrations capture the festive holiday. In Susan Lynn Meyer’s humor-filled tale, two families share a home in Apartment 4B, where they are eager to celebrate Passover. Young Eli Winkler is welcoming his human family’s guests to their seder in their “Abovestairs” apartment. Under the Winkler’s floor is the young Miriam Mouse and her mouse family, who live “Belowstairs” and occasionally enter the Winkler apartment through a tiny round mouse hole. This year, the Winklers have stored their matzah in a tightly sealed tin box and Miriam Mouse hasn’t been able to find any stray pieces for her family’s holiday. When Miriam spies Eli’s father hiding the afikomen, the piece of matzah needed to conclude the seder meal. Who will find the hidden matzah first, Eli or Miriam Mouse? Miriam Mouse finds the perfect solution for both families. In this gracefully told story, Elka Weber takes kids back in time to ancient Jerusalem, where a curious boy named Shimri is told he’s too young and small to help his older and bigger family members plow the fields and draw water from the faraway well. When Shimri learns that King Hezekiah is looking for ideas on how to bring water inside the city’s walls, he wonders if the king will listen to a small boy’s solution to the problem. The fictional story is inspired by Hezekiah’s Tunnel, which was dug during the eighth century BCE, an engineering feat for its time.